Gallia Academy senior Abby Cremeans (2) attempts a layup, during the Blue Angels’ 63-37 victory on Monday in Centenary, Ohio. Gallia Academy sophomore Maddy Petro (5) leads a fast break, during Monday’s OVC opener in Centenary, Ohio. CENTENARY, Ohio — All they’ve done is win, win, win… no matter what. 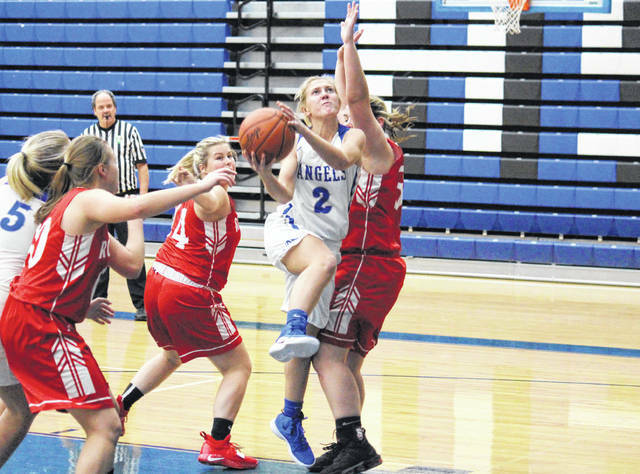 The Gallia Academy girls basketball continued its perfect start to the season on Monday in Gallia County, as the Blue Angels defeated guest Rock Hill by a 63-37 tally in the Ohio Valley Conference opener for both squads. The Blue Angels (3-0, 1-0 OVC) scored the opening two points of the game, before the Redwomen (0-2, 0-1) tied the game at two. GAHS ended the period with an 18-0 run and never relinquished its lead. Gallia Academy’s edge grew as high as 20 points in the second quarter, but the margin was trimmed back to 18, at 35-17, by halftime. GAHS outscored its guest by an 18-to-10 clip in the third period and headed into the finale with a 53-27 advantage. 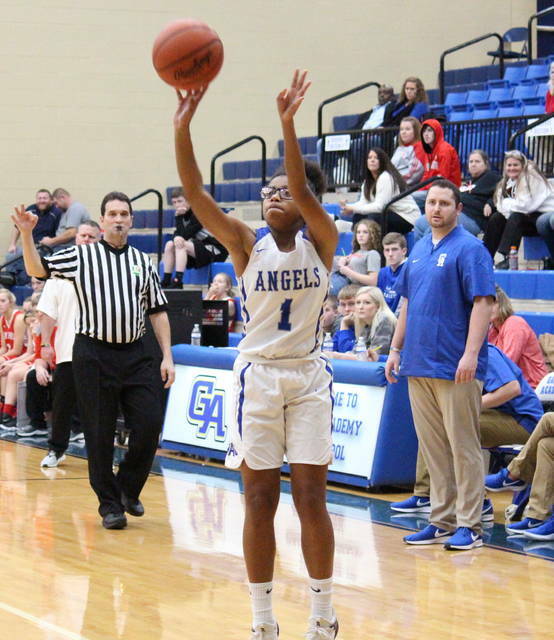 The Blue Angels’ lead grew to a game-high 32 points with five minutes to play in regulation, and the hosts cruised to a 63-37 victory. After the win, first-year GAHS head coach Jordan Deel was thrilled with his team’s defensive effort, as the Blue Angels allowed a season-low 37 points. The 63 points poured in by the GAHS offense is also a season-best for the squad, something Deel credits to getting a more players in on the action. For the game, the Blue Angels shot 27-of-58 (46.6 percent) from the field, including 4-of-14 (28.6 percent) from three-point range. Meanwhile, Rock Hill was 15-of-49 (30.6 percent) from the field, including 0-of-8 from deep. At the free throw line, Gallia Academy was 5-of-11 (45.5 percent), while RHHS was 7-of-10 (70 percent). The Blue and White won the rebounding battle by a 39-to-23 count, including 15-to-7 on the offensive end. Collectively, the hosts had 14 assists, 11 steals, one blocked shot and 18 turnovers, with just a third of the giveaways coming in the first half. RHHS finished with team totals of eight assists, seven steals, three rejections and 20 turnovers. 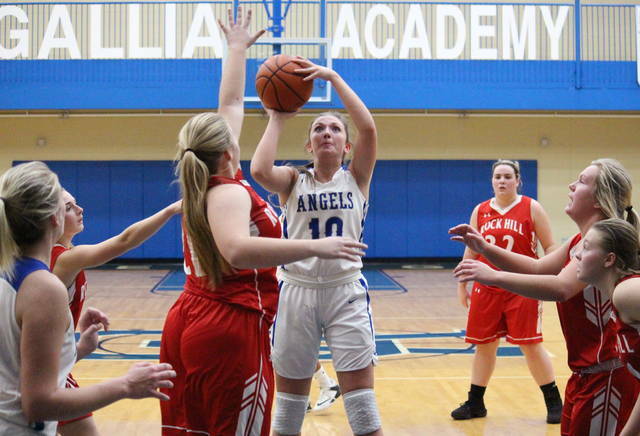 Gallia Academy’s offense was led by senior Hunter Copley, who drained three triples en route to a game-best 25 points, while pulling in eight rebounds and dishing out five assists. GAHS sophomore Maddy Petro recorded a double-double of 17 points and 17 rebounds in the win, while Brooklyn Hill made one three-pointer and finished with 13 markers. Junon Ohmara, Abby Cremeans, Katie Carpenter and Koren Truance had two points apiece for the victors, with Ohmara marking a game-high six assists. The Blue Angel defense was led by Cremeans with four steals, and Copley with three steals and a block. Rylie Morris scored a team-best 11 points for the guests, followed by Makayla Scott with 10. Kelsey Olderham had five points in the setback, Kenzie Hanshaw added four points and a team-high six rebounds, while Savannah Cade had three points and a team-best three assists. Savannah McGraw and Autumn Porter finished with two points apiece for the Redwomen. Cade led the RHHS defense with two steals and a blocked shot. 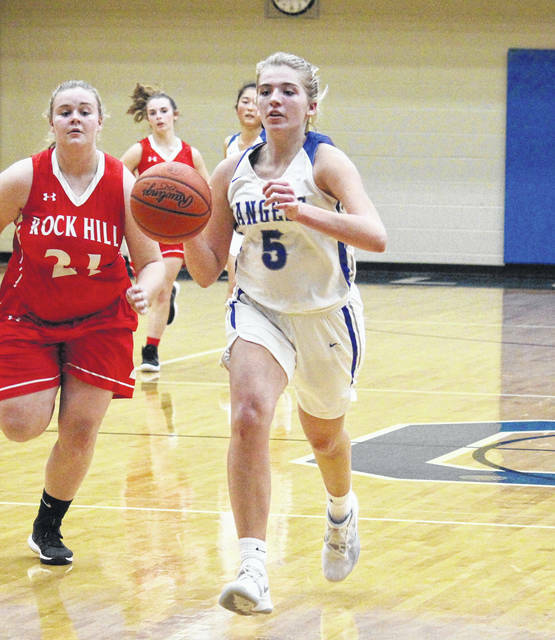 The Blue and White will go for the season sweep of Rock Hill on Jan. 17 in Lawrence County. Gallia Academy continues league play on Thursday at Ironton.